Just so you know, Spain is huge! There is no point booking a winter beach wedding in the north of Spain in the freezing wet when on the same day in the southern Costa del Sol it is ten degrees warmer with bright sunshine and blue skies. Likewise, you will totally cook in mid summer when the shade temperature in Cordoba city reaches over 40 degrees, whilst a city centre wedding in the Basque country in summer is just perfect. There are 17 autonomous regions (a bit like American states) and each has its own identity depending on its history and its climate. Consider this very carefully when deciding in what part of Spain you want to celebrate your elopement or wedding ceremony. 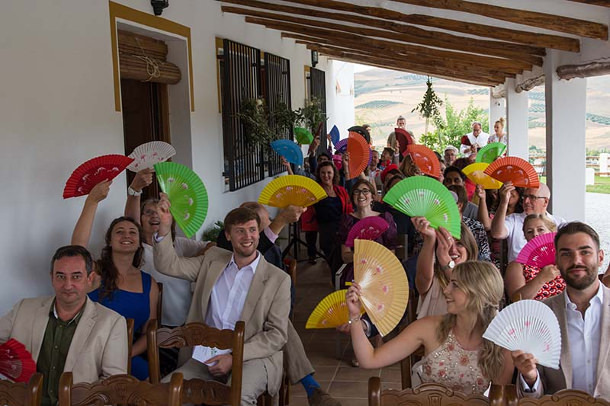 Here are a few top tips from local wedding suppliers for getting your Spanish Destination Wedding location just right. Andalucia (sometimes spelled Andalusia) is in the southern most tip of Spain and boasts an average of 320 days of sunshine a year. The Moorish influence can be seen in the architecture and heard in the place names, and on a clear day you can even see Africa from some vantage points. On the southern coastline you will find the Costa de la Luz (which borders Portugal), the Costa del Sol (with Malaga international airport) and the Costa Tropical (Granada). The palm tree fringed beaches and almost guaranteed year round weather in Andalucia are perhaps the biggest attraction for couples with a vision of a beach wedding. 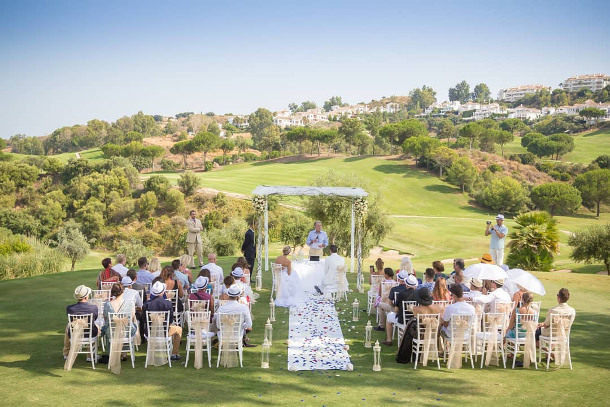 Local top tip: Greg Korvin, photographer, advises avoiding bikini-clad onlookers wandering into the photographer’s shot of your first kiss, by opting for a ceremony at one of the gorgeous golf resorts along the Costa del Sol such as La Cala Golf Hotel Spa. Local top tip: Celebrant Debbie Skyrme says the Sierra Nevada is the longest ski season in Europe from late November to early April. 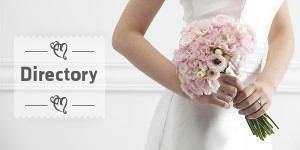 Why not combine your beach wedding on the Costa Tropical with a ski or snowboarding honeymoon just an hour away?! 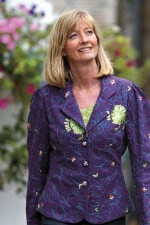 Local top tip: Seville celebrant Diana Lacroix recommends perhaps one of the most romantic city venues in Spain in the gardens of Villa Luisa. Moving along the east coastline of Spain in the direction of the Costa Blanca, the provinces of Murcia and Valencia offer contrasts of pace and lifestyle. Passing through pretty fishing villages, the impressive skyline of Benidorm contrasts not only the architecture, but the pace of life too. What better place to combine your hen or stag celebrations with a quieter, low key romantic wedding setting like breathtaking Guadalest. The Catalonian capital is Barcelona which is famous for its’ Gaudi architecture and inspiring fairy-tale wedding settings. The area is famed for its gastronomy too, so why not capitalise on the fairy-tale theme and plan a wedding breakfast banquet in your very own castle. Love Gaudi? 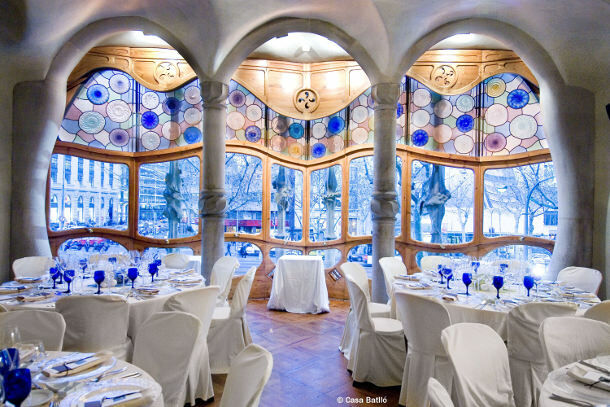 You will be stunned by Casa Batlló which has the most magical hall in which to host your wedding ceremony. The north of Spain was never conquered by the Romans or the Moors, which is still evident in the strength of feeling in preserving the Basque language, in fact traditional Spanish is not really spoken here! San Juan de Gaztelugatxe is probably the most dramatic location in the Basque Country. Think of the winding route to the chapel perched high on the cliff in Mama Mia and you get the picture… only much more blustery! In the north west of Spain, the countryside of the regions of Cantabria, Asturias and Galicia is dramatic with forest covered mountains and deep verdant valleys. There are some incredibly beautiful locations for weddings, including monasteries and paradors found on the pilgrim routes that lead to Santiago de Compostela. The people of Candelario, in the biggest region in Spain, love their weddings so much that there is even an August fiesta with actors re-enacting a 19th century wedding in which the bridal couple wear traditional red and black. Central Spain and Don Quixote country with vast plains. Remember, the rain in Spain falls mainly on the plains! Think Madrid City, think palaces! Here you will find some of the most grandiose wedding venues, with the Westin Palace featuring amongst the most opulent. Local top tip: Glynis German, well-known celebrant on the Spanish island of Mallorca recommends the Belmond La Residencia. This luxury mountain hotel is made up of twin manor houses and is surrounded by olive trees and manicured gardens. With a reputation for the nightlife in Ibiza Town, the interior of the island is a total contrast and the hidden coves dotted along the coast are well worth exploring. Think of Tenerife and you may think of volcanic mountainous landscape, black beaches and bananas, however the year round climate means that a wedding in one of the five star hotels on the island pretty much guarantees you a glorious sunny backdrop to your photos.